I love Science Fiction movies and TV, but what really got me into the genre were the Asimov anthologies. Nightfall is still the best short story I've ever read. Here are a few places I've found to read science fiction on the web. Put together by Michael Swanwick there are a lot of good flash fiction stories here. The theme itself is that each one of them is about one of the elements. This can on occasion be a stretch, there just aren't all that many good flash fiction stories about Xenon. This is a great tool for science teachers or people who just like flash fiction. 2. Diamonds in the Sky - An anthology of science fiction based on Astronomy. This is funded by the National Science Foundation and it looks like it has some good stuff. 3. Free SFreader - No actual stories here, but there are links to a ton. The SFreader has been rating science fiction stories online for a while now. This is a good way to find stories at least one person liked. 4. Podiobooks -- There is something about reading a story yourself which is special, but there is also something about actually having time to read a story which is required to do that. Podiobooks are podcasts of books. Usually sent out a chapter a week this is a great way to get your fiction fix when you're too busy to sit down and read. 5. Baen's Free Library -- Not only are there free books here, but an excellent explanation of why putting free books online is good. He also compares online piracy to brats stealing chewing gum which is about right. It might be illegal but it's really not all that big a deal. 6. 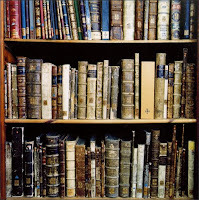 Project Gutenberg -- There is a lot more here than science fiction and fantasy. Project Gutenberg is gathering together all kinds of public domain stories, but it still has some of the best science fiction ever written including, Mary Shelly, Mark Twain, Jules Verne and H.G. Wells. A great place to catch up on the classics you avoided reading in high school. 7. Hub A good online magazine with interesting stories. 8. Abyss and Apex - Three good magazines which have tons of stories, editorials and reviews online. Check them all out. 9. Cory Doctorow - Doctorow not only puts up his own fiction, but lists other authors who do the same on his blog. Putting your work online is how things are going to be and he's leading the way. 10. Strange Horizons - Lots of stories, articles and a gallery of art as well.